Join us next summer for mountain biking and trekking in the incredible landscapes of the Albanian Alps. This ten-day tour to benefit local schools is lead by Fulbright Scholar Steve Cook and will provide, beyond expansive landscapes and traffic-free riding, an up close and highly personal glimpse into life in Albania. We are unlikely to see other foreigners in the mountains. Volunteers are sought to remain on in the area after the tour for English teaching. This bike/trek is designed to accommodate most travelers—bikers, trekkers, and bus riders. Paved roads are generally in poor condition. The mountain roads range from poor to very difficult—American mountain bikers would call them “double track.” They are often steep and can be “paved” with loose rocks the size of a fist. The good thing is an almost total lack of vehicles to worry about. The treks are along established mountain trails, but there is no maintenance on them, they are there to get animals from one place to another. The trek over the first pass is difficult and takes about 5 hours. The second one is more difficult and requires very good conditioning. Non bikers or trekkers, have the option for day hikes on several occasions. For those who wish to see a unique, seldom seen landscape, the bus accesses some awesome sights—to simply ride along becomes an adventure. Professor Steve Cook (PhD in Geography), organizer and tour leader, has been associated with Albania since 1992. He had a US Government Fulbright Scholarship to teach at the University of Shkodra in 1996, and in 2001 he and his wife Terri established the Albanian Alps Institute, which focuses its resources to help children in a school district of Northern Albania. 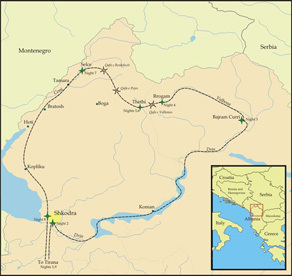 He has biked and hiked northern Albania since leading his first guided trek in 1993. Steve will be assisted by one or two bilingual Albanians, residents of the mountains in which we will travel. Your tour fees cover almost everything with the exception of your visa and entry/exit fees. It is possible to rent bicycles in Albania, but we encourage you to bring your own. We will meet your flight upon arriving at Renas Airport near Tirana on day 1. If you arrive by land, we’ll meet you at our hotel the first night. We are going into the most remote part of the poorest country in Europe. Sometimes things don't go as planned. Weather may not cooperate. For example, there may be too much snow to follow the treks outlined, necessitating alternatives. Roads wash out, vehicles break down, hotels close. These challenges can be seen as problems, or as simply part of the excitement of traveling "off the grid." We will do our best to provide an experience that you will cherish forever. * All proceeds benefit the Albanian Alps Institute.